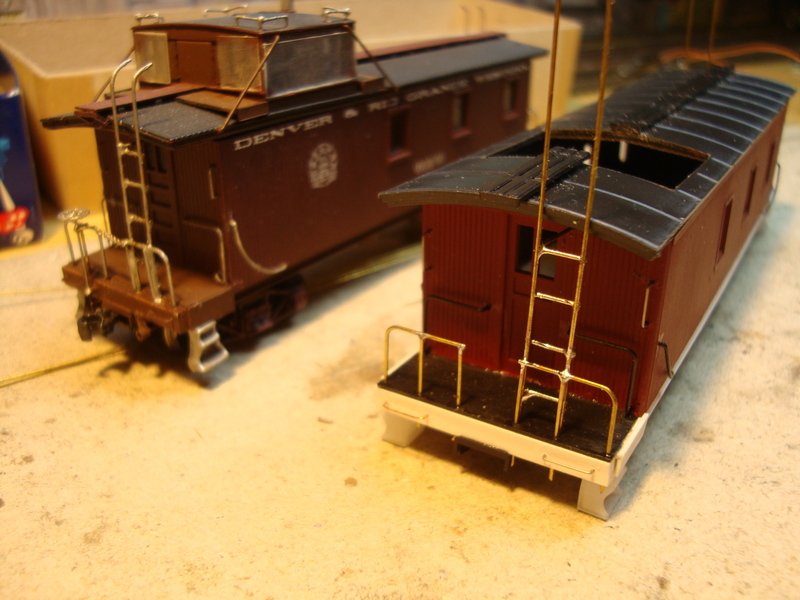 On the US-Convention in Rodgau, Hessen, Germany was a swapmeet and i found an old Roundhouse caboose kit, painted but unlettered and priced at 5.00 Euros. O.k. what can you do with it? 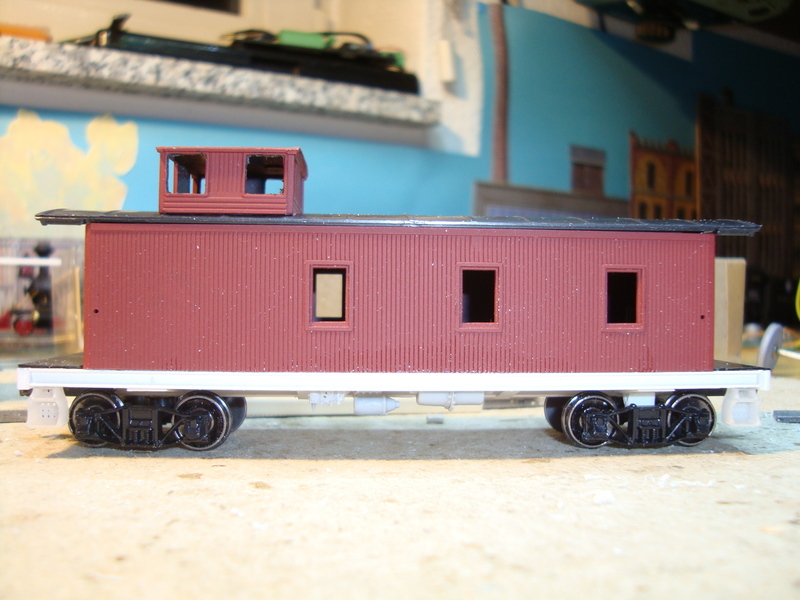 Still having too few cabooses in my rolling stock, so i purchased it. At a first glance this my become a fine stand in caboose for D&RGW. Yes there are D&RGW cabeese ready available, but all of them are narrow gauge. Here am standard gauge minded and there is simply nothing for the steam aera available. 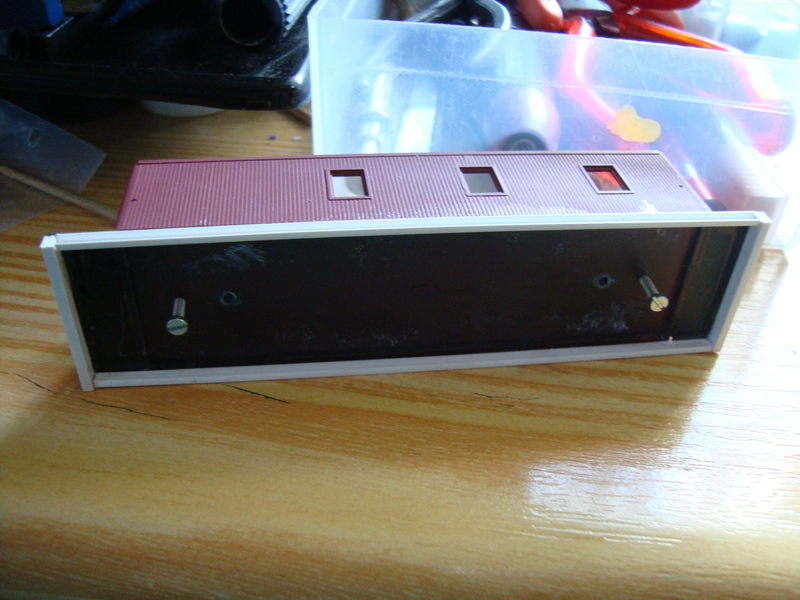 This was in the kit box and i added some addional and replacement parts also. 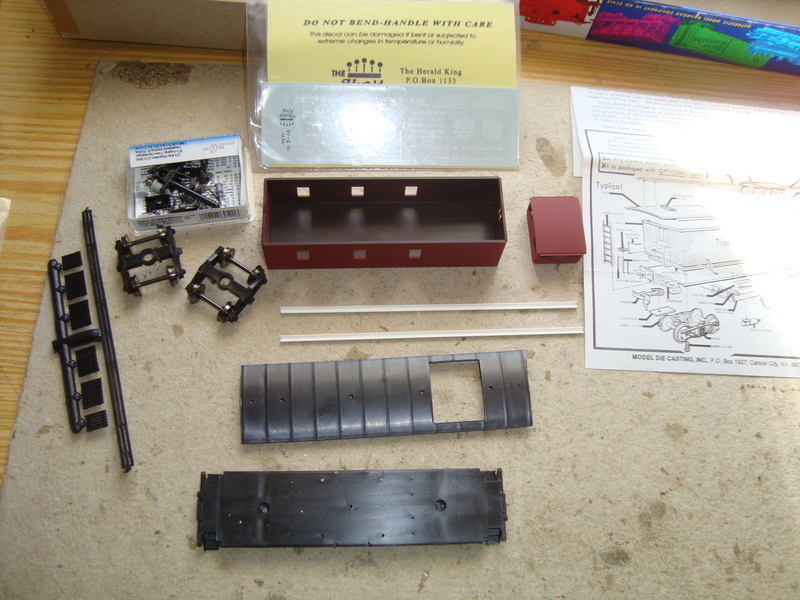 There are 4 Intermountals wheelsets, 2 Kadee scale couplers and their appropiate boxes, 2 channels for the new side sills, a Herald King Decal Set for Rio Grande caboose, some small parts for brake equipment and some more. 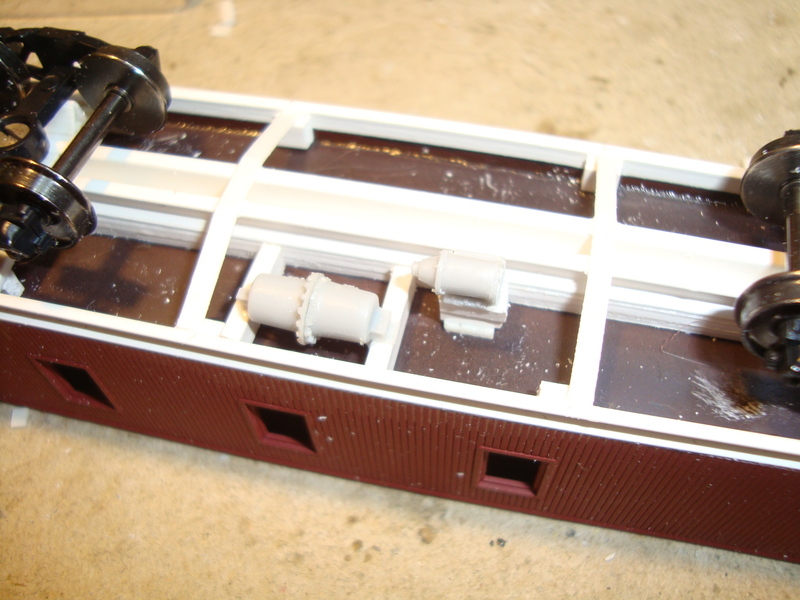 I started with the cupola and enlarged the windows. This should be nifty! Can't wait to see what you do with it. 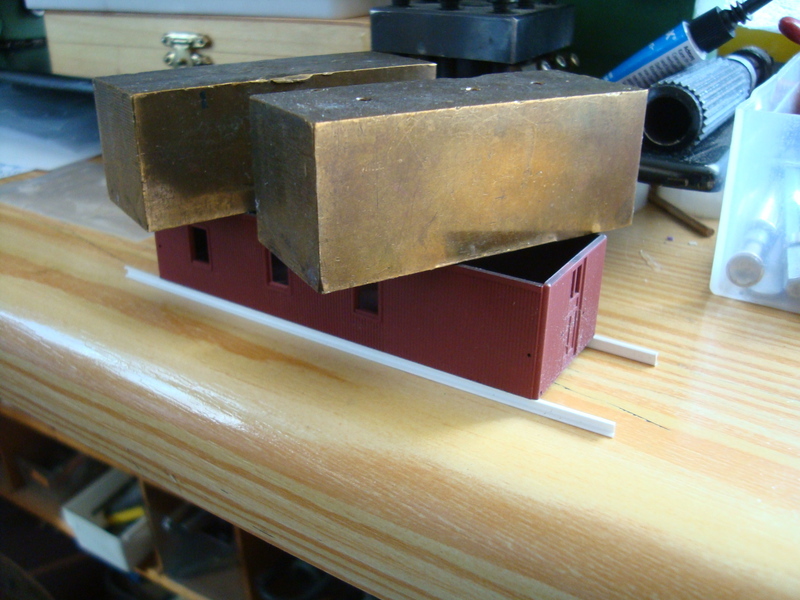 This particular caboose is quite easy to bash to fit any prototype. 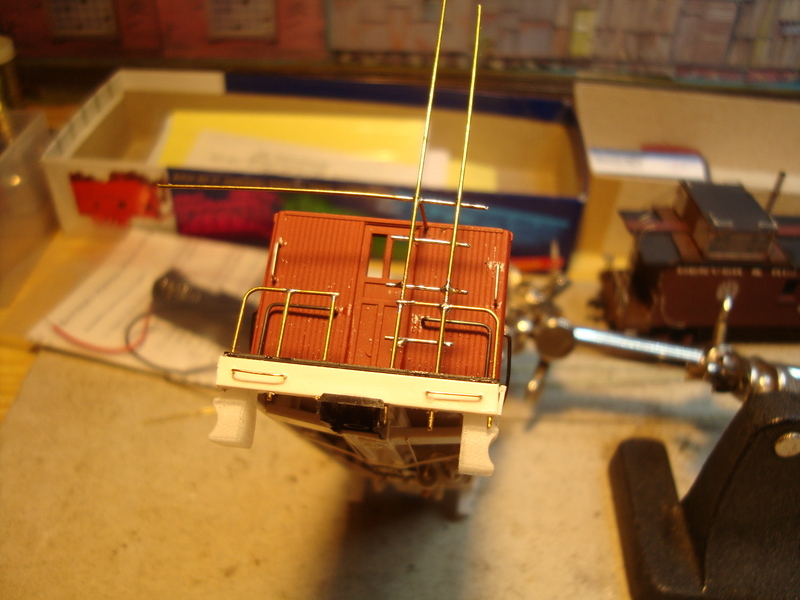 I once converted one into a CNR prototype, removing one pair of window and reworking extensively the cupola. I'm pretty sure you'll be able to turn it into something near the original D&RGW prototype you want to replicate. 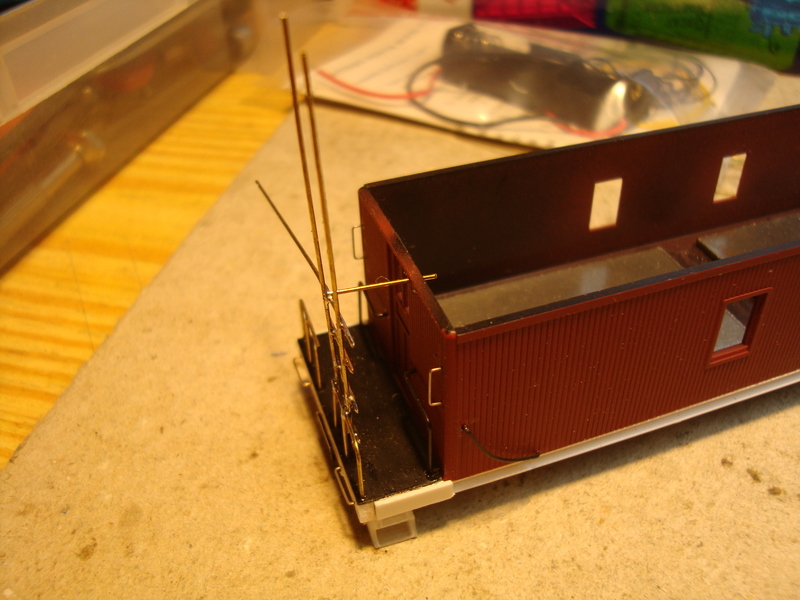 you will have to kitbash or buy very expensive brass imports if you want a D&RGW standard gauge caboose. 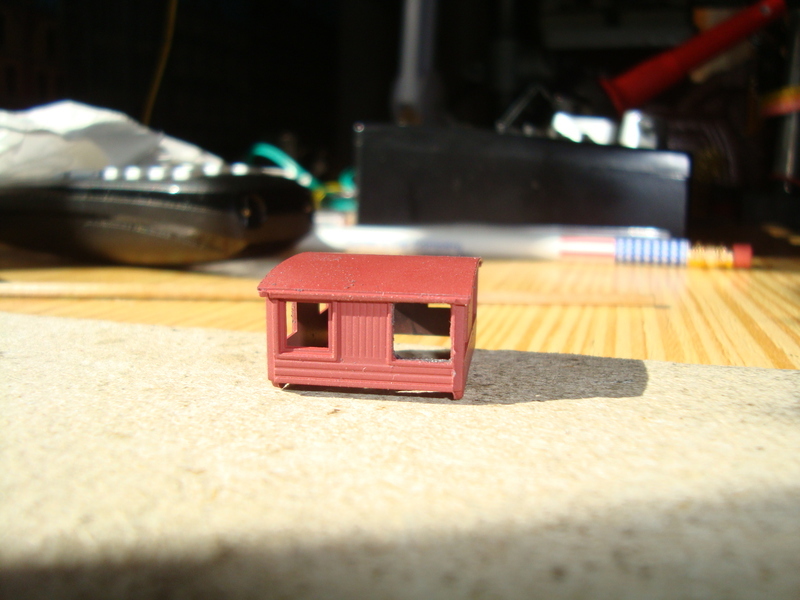 And for myself, not at least for financial reasons, i try my luck to kitbash this old Roundhouse kit. First the lower parts of the sides were marked. 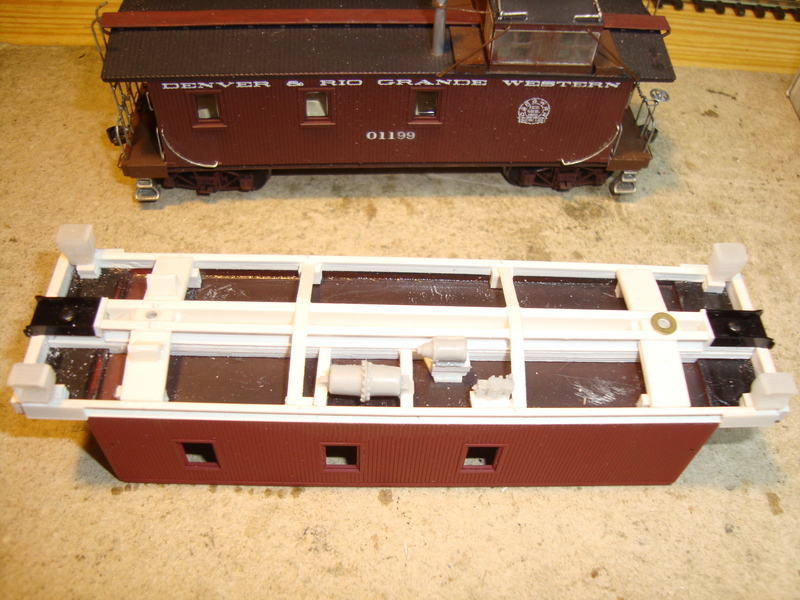 As you can see, the Standard Gauge caboose has a steel underframe were the side sills are visible. Also one of the windows, the left one in the photo of the model above, should be replaced to an location nearer to the middle window. I decided not to do so an leave the window where it is, you will have to make some compromises. The excess portion of the sides were cut by an sharp knive. And filed flat and even. 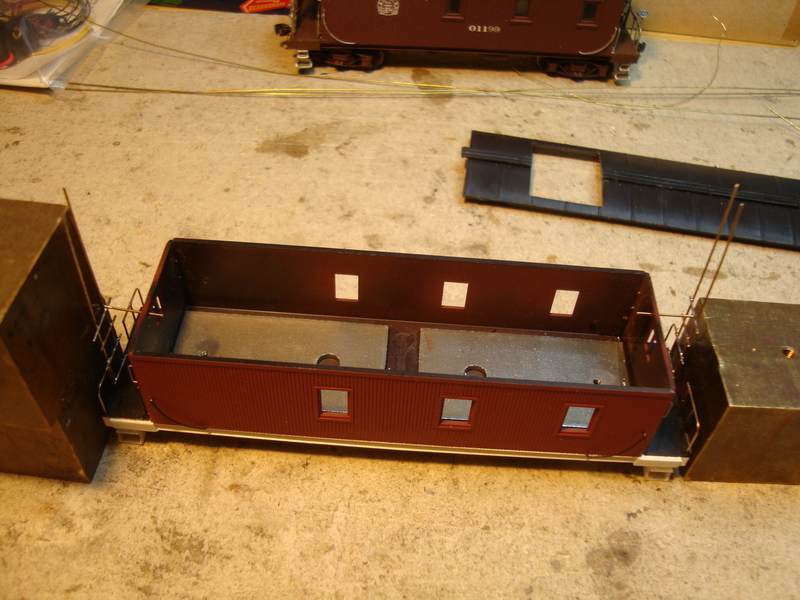 Also the two gudgeons were removed, because the caboose will get a stretched pivot pin base. 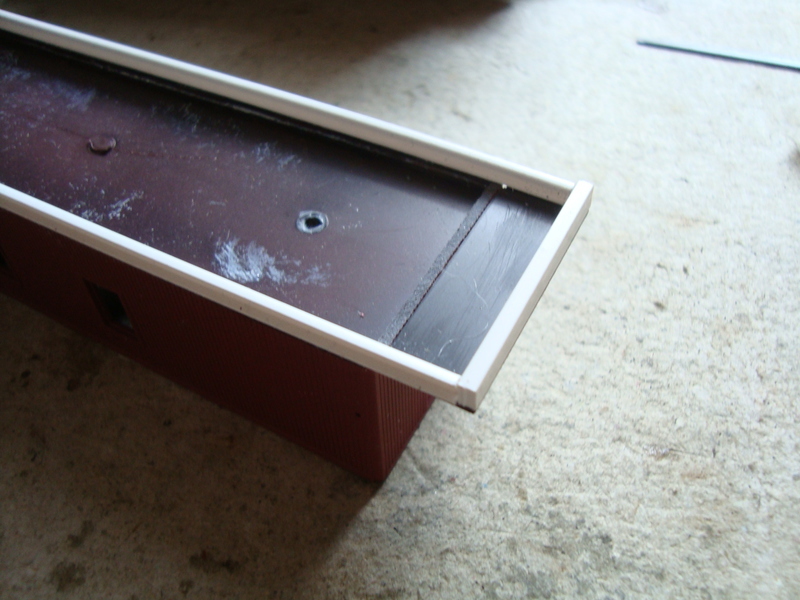 Glueing the new side sills. 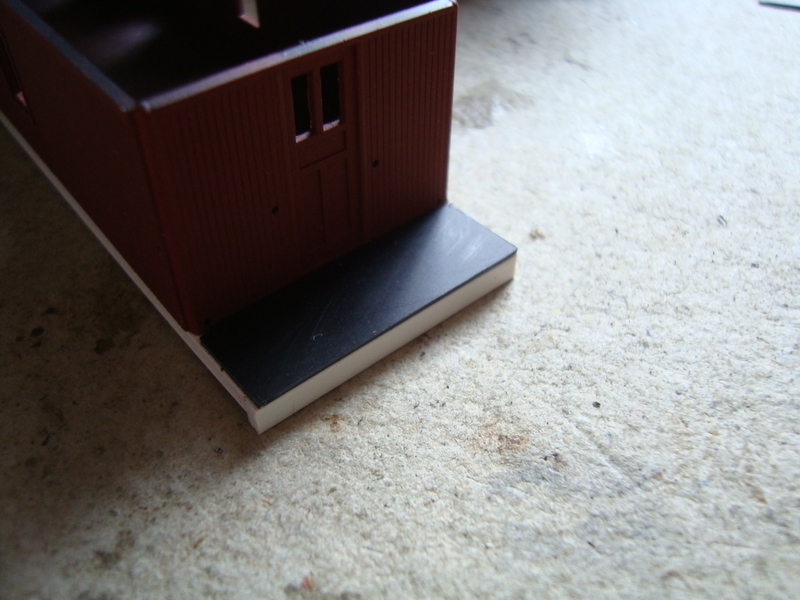 The new sills are C-channels of suitable seize from Plastruct. 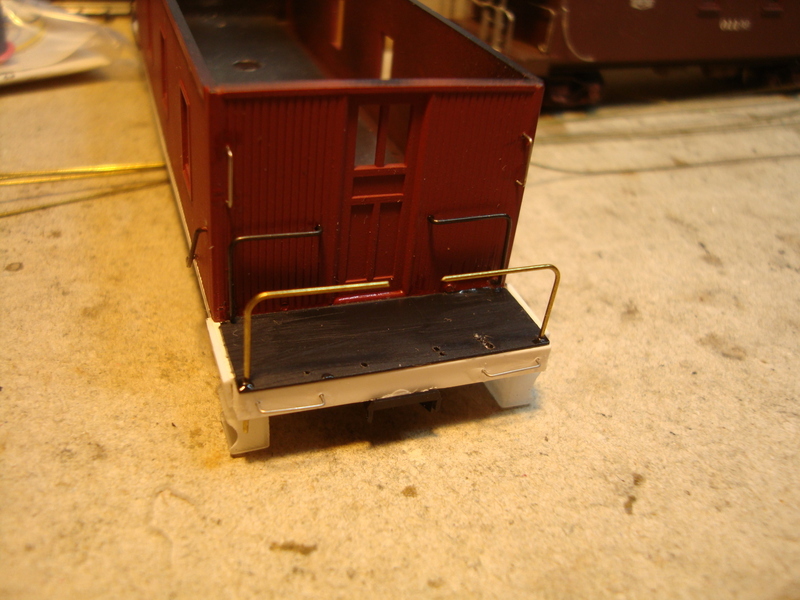 Then i decided not to use the original bottom which was included in the kit. Instead to built my own from scratch. 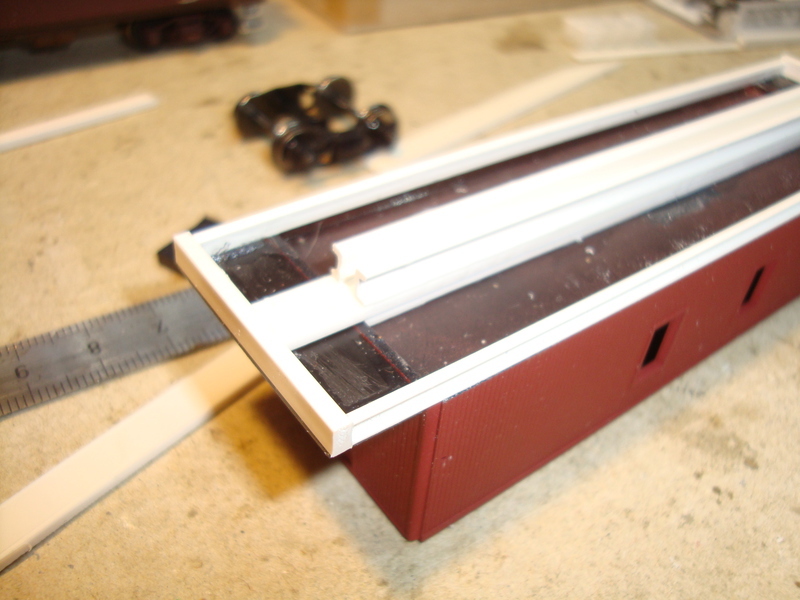 The sills were weighted down until the glue has hardened. 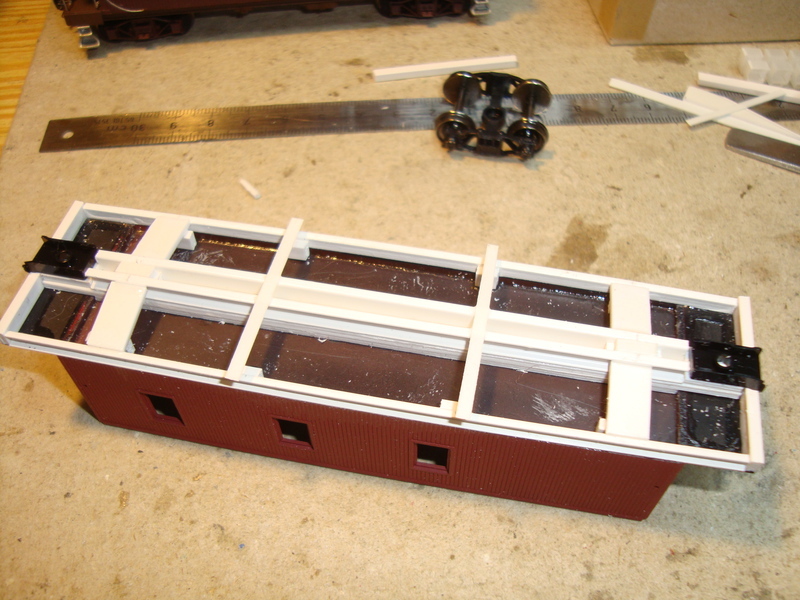 End platforms and end sills were mounted. So it looks alike now. Then there was the question with the different wheelbase. The pivots for the truck were more apart than given here by the kit. So i removed the old pivots and set new ones. As i had no blueprints available, i had to determine them with the aid of some old photos. There is no absolute measure, but instead an "looks right" according to prototype photos. 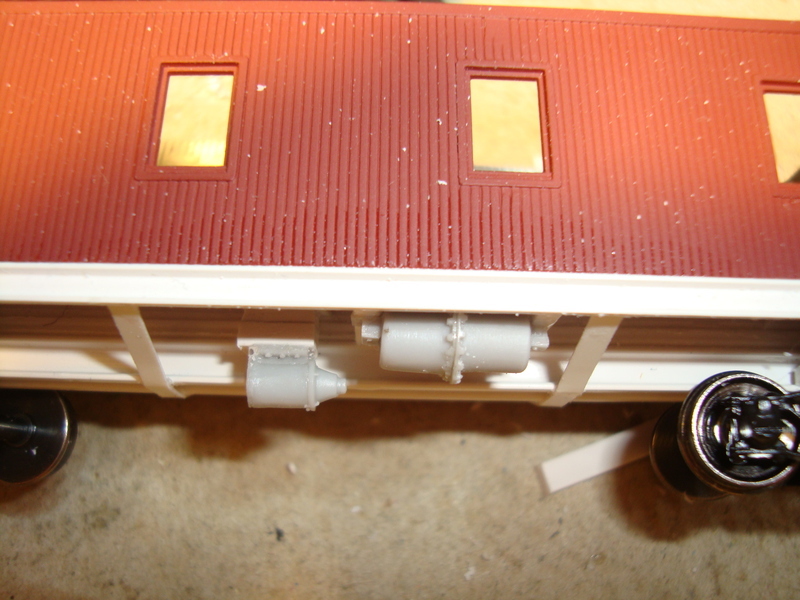 As the caboose wil get no interior, i glued the weights inside. Then the bottom and the weights were drilled and tapped giving a stable base for the newe pivots. The the question of the platform steps was again topical. 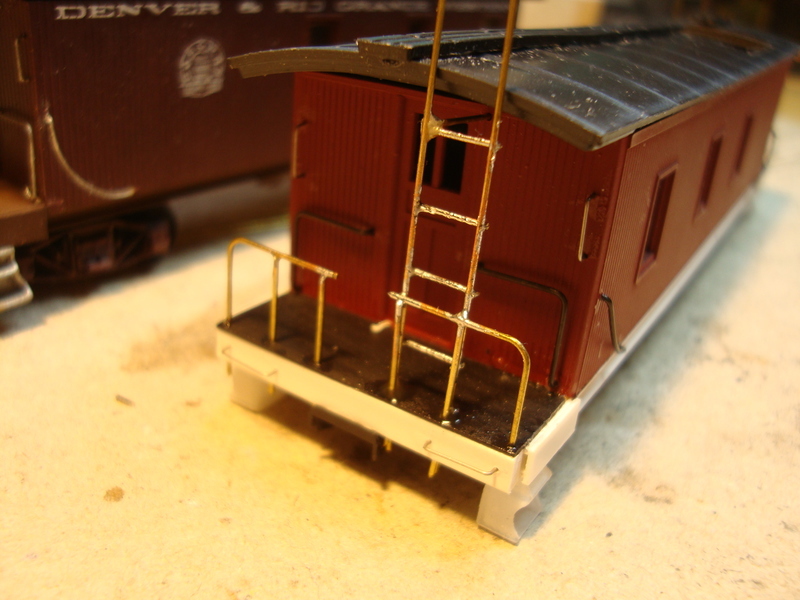 The D&RGW caboose steps were very similar to cast iron tender steps. For the last kitbashing i found brass parts, but then discovered on the shapeways pages these 3-dimensinal printed steps. A little bit more contrast here. I decided to have a try with this printed parts. 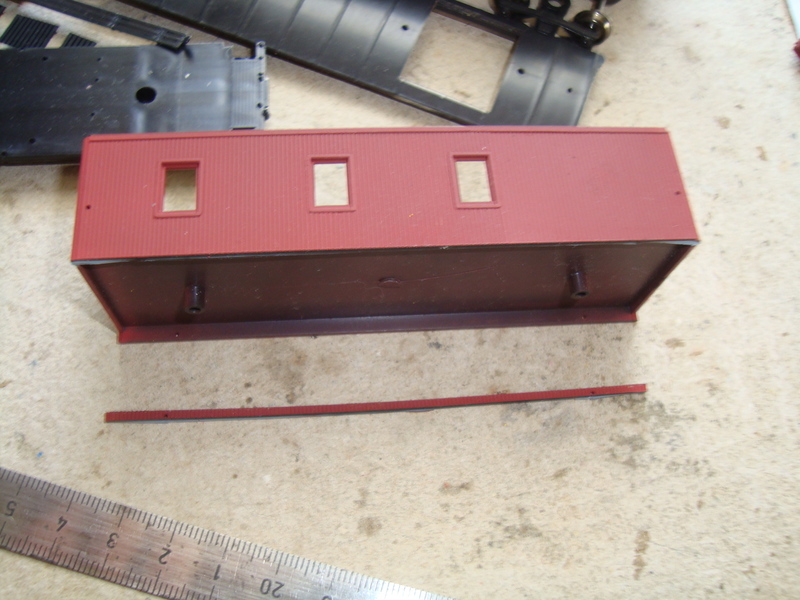 They are small enough so that the "stair steps effect" is not so visible as it will be the case on a rounded roof contour. 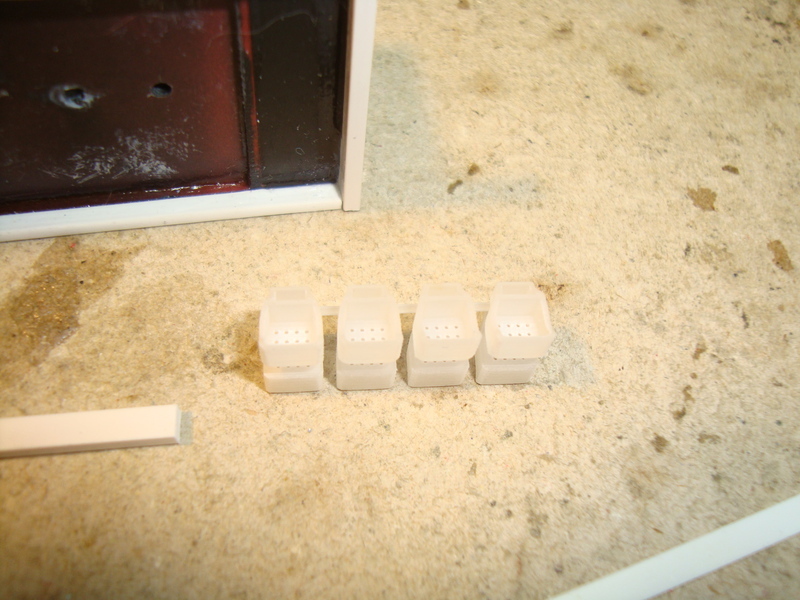 Sorry, because all parts are out fo white styrene and ABS, the contrast on tghe photo is very weak. 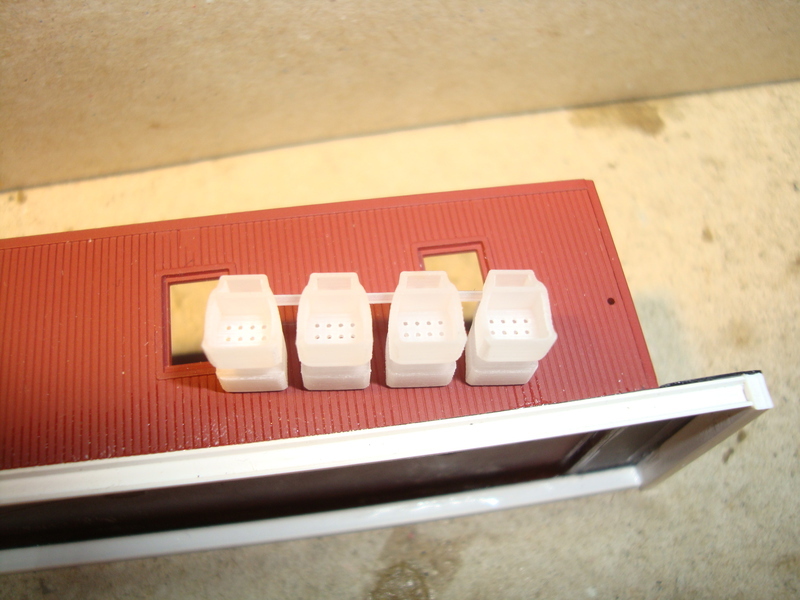 Getting the Kadee coupler boxes inti the right height, a little shimming was necessary. Also the truck bolsters were made. And the cross members come into being. The mountig bores for the trucks were drilled from the inside with a small diameter drillbit. 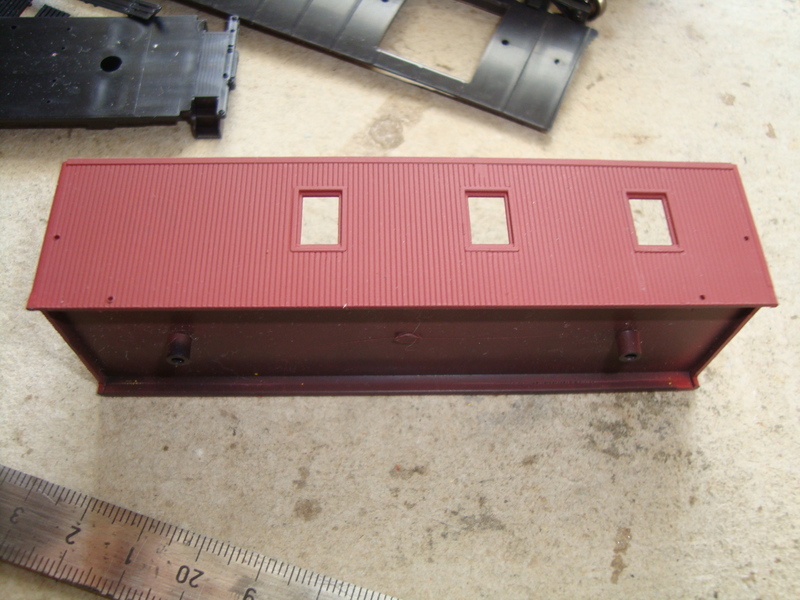 Then enlarged by an slightly bigger drillbit to make room for the screws. 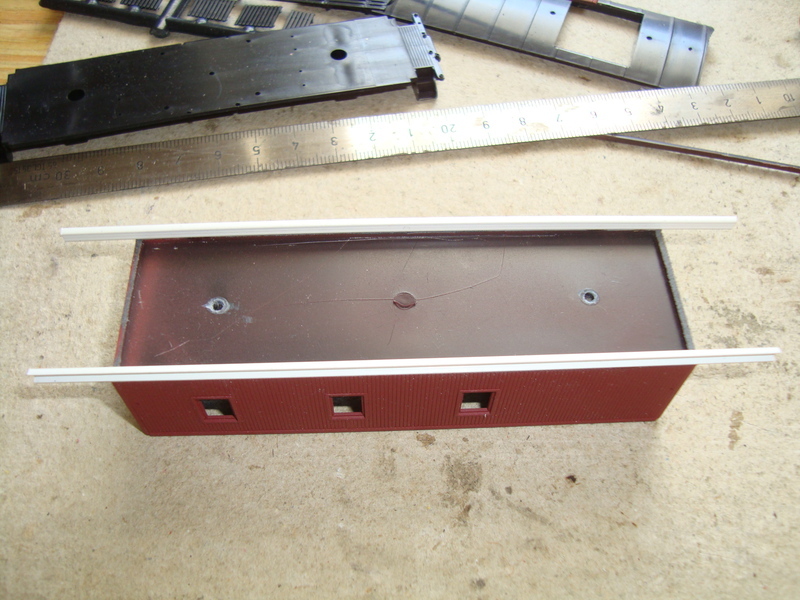 Nothing is more fun than building parts that follow the structural design of the prototype. Neat stuff! Out of the depths of my grab boxes are the parts for the brake equipment. To mount them in their correct position, cross members and pedestals were made. Checking photo from another angle. 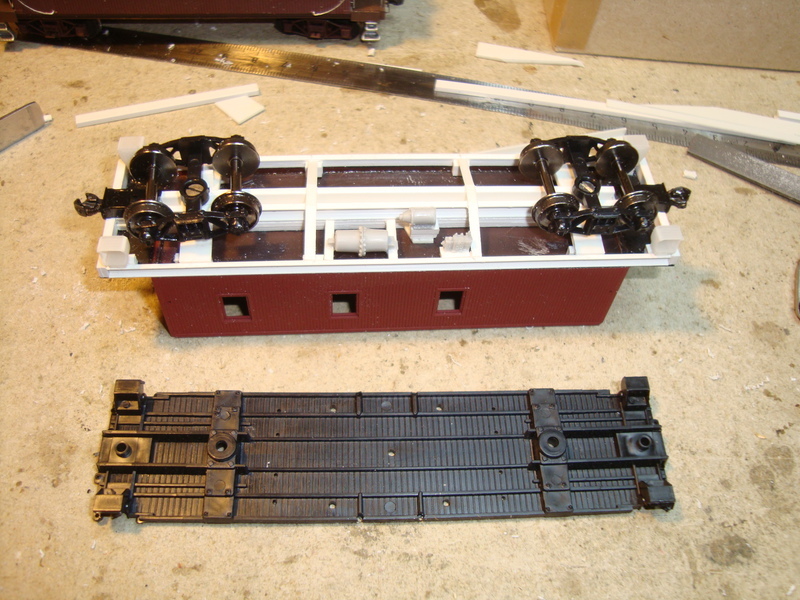 A comparison beween the original and the newly built underframe. Meanwhile the triple valve and the steps were mounted. The 3-point suspension was made. Left there were 2 pieces of L-shaped profile glued onto the crossmember to form 2 of the points. The truck here can swivel and teeter in one direction. Right there was a brass washer forming the 3rd point of this side. The truck here is able to pivoting nearly free here. So the often seen uncomely tilting and wobbling of a car is eliminated here. At first the levers were positioned. 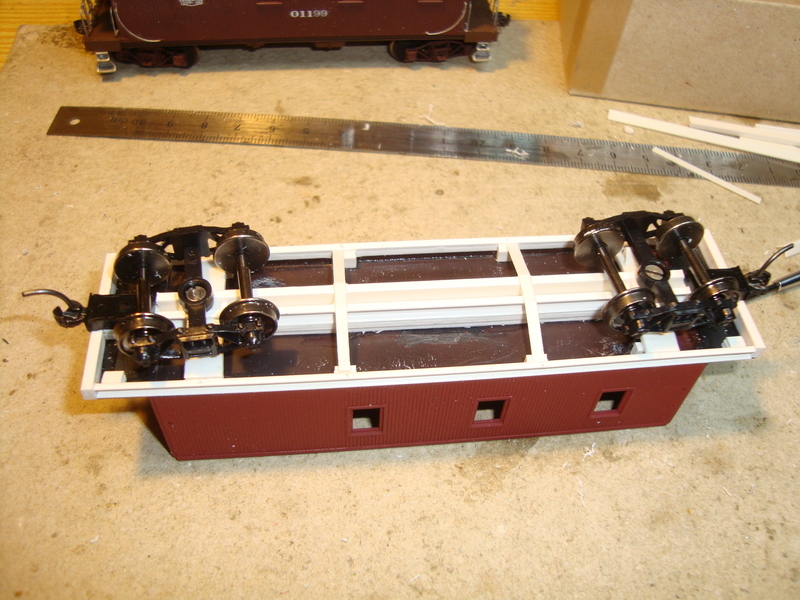 As the cabbose has hand brakes on both platforms, there are 3 levers necessary. Doing some rodwork. The hand brake lever is connected by a short lenght of chain to the brake system. From the other side. Not yet fully satisfied. The grab irons uincluded with the kit were mounted and additional grab irons too. 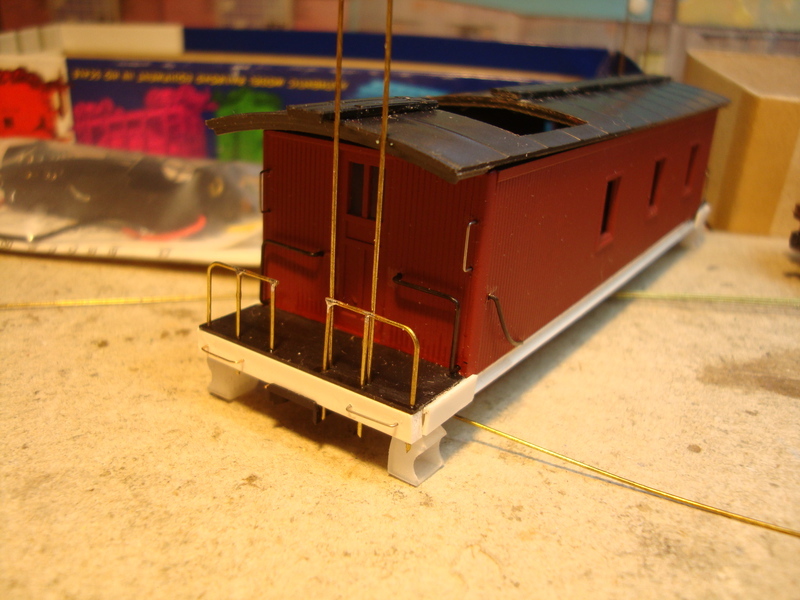 Platform railing starts with two pieces of 0.5mm brass wire. 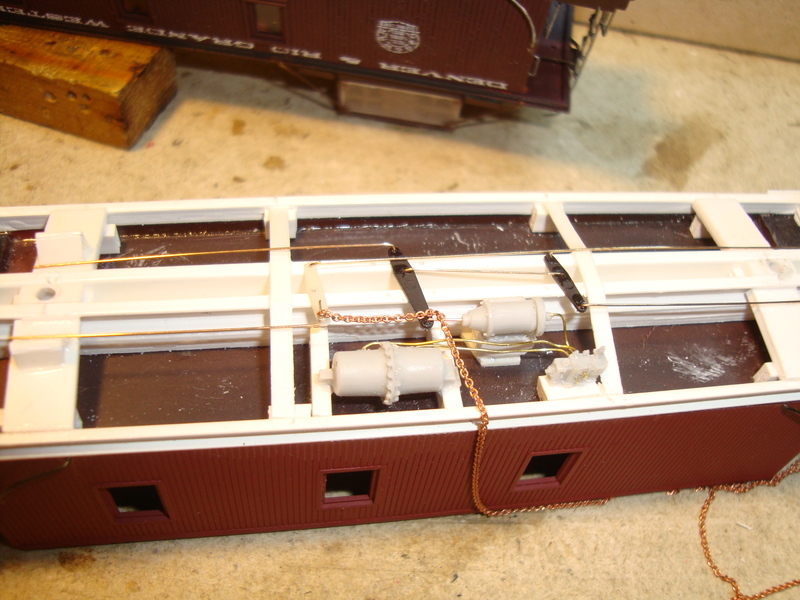 More stanchions were added and mounted with a combination of soldering (top) and glueing (bottom). Control photo if everthing is straight and fits. Not until then lower ends were fixed by glueing with CA. 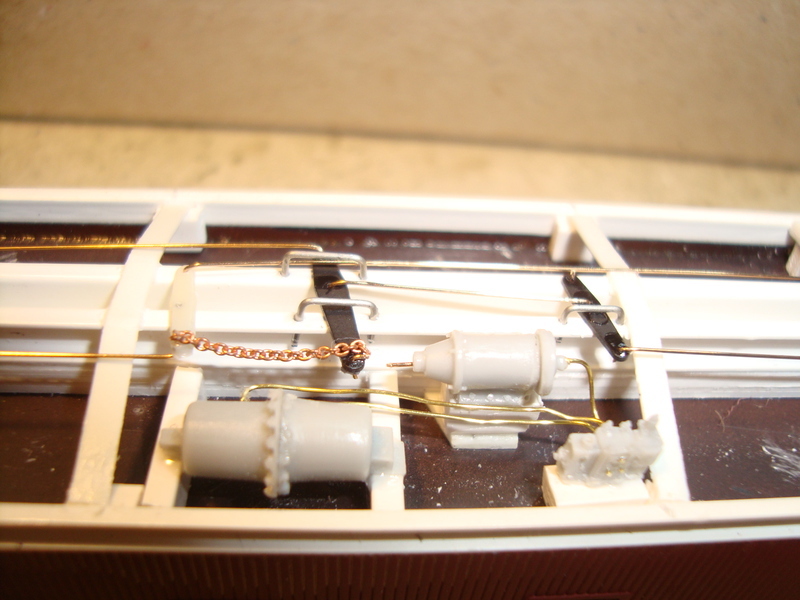 These pieces of 0,5mm brass wire will become the ladder beams. 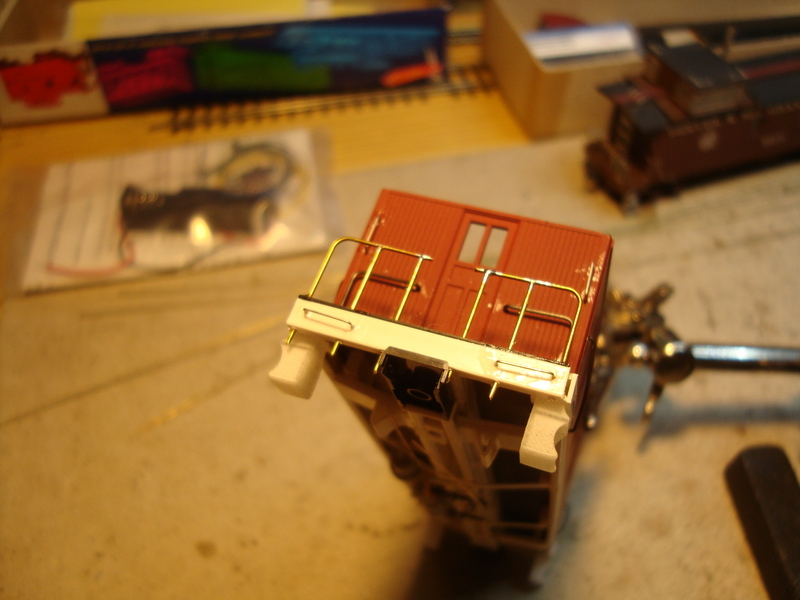 The ladder spokes were soldered wild, by visual judgement only, onto the beams. 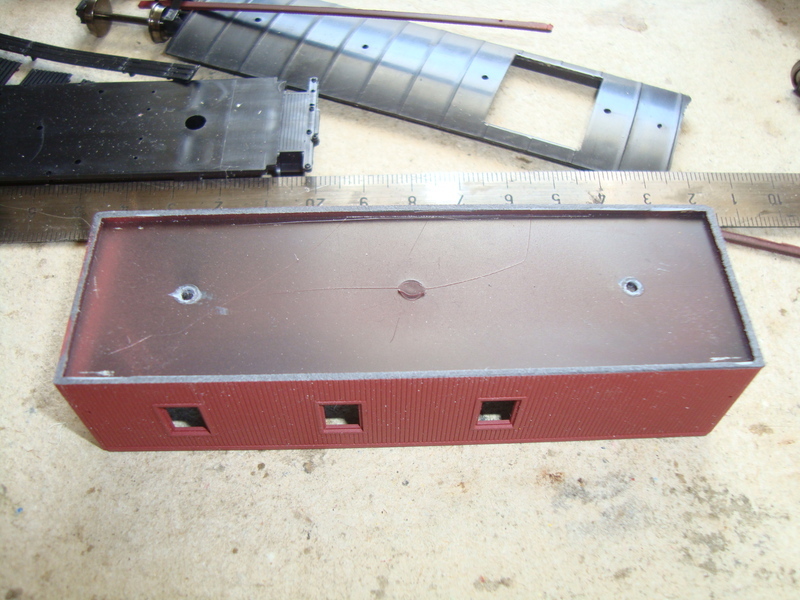 As the roof should be removeable, the ladders were stabilzed by this pieces to the bulkheads. 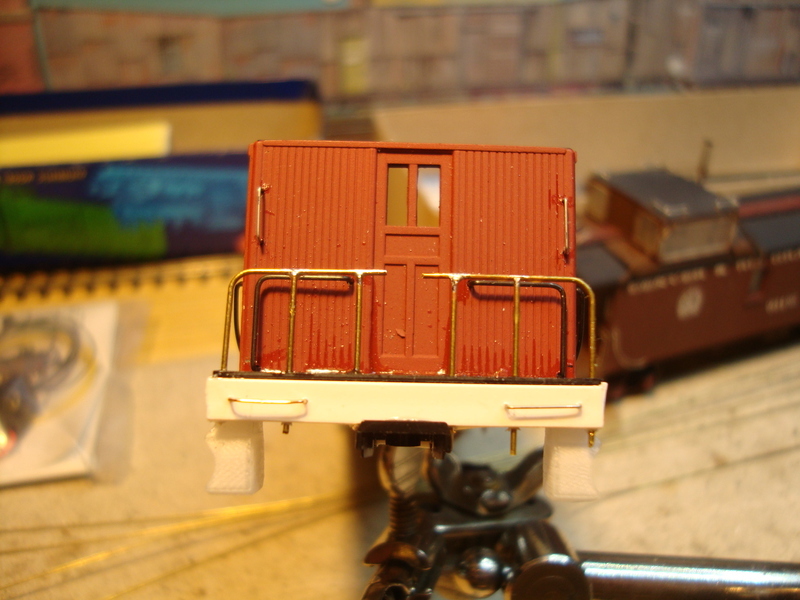 Remember this will become a caboose for sessions on a Fremo layout. 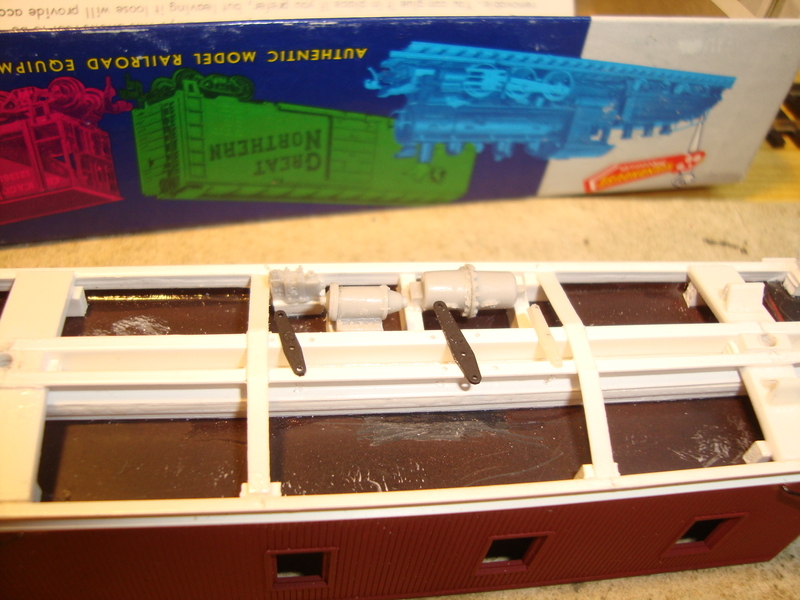 The additional struts later will be invisible because they are very tight unter the roof. Cut excess ends of the spokes. 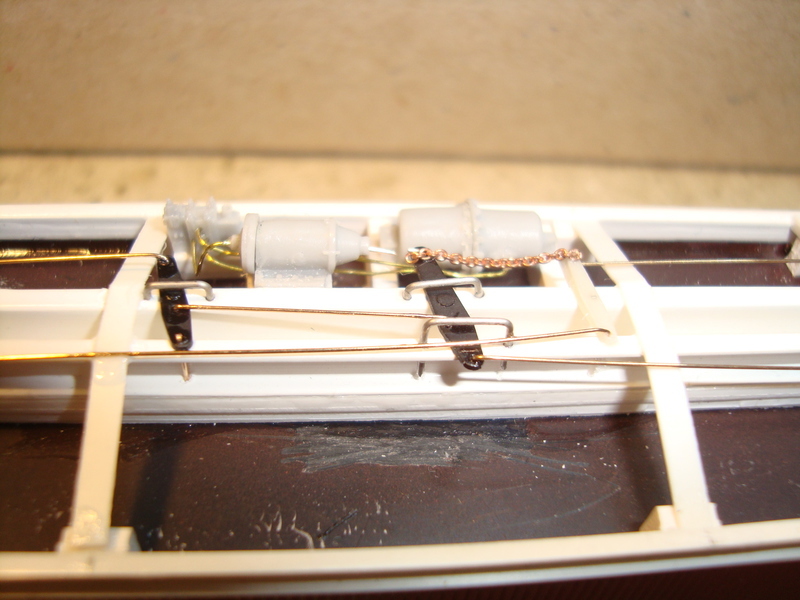 The ladder beams are also soldered to the end railing zu create still more stability. 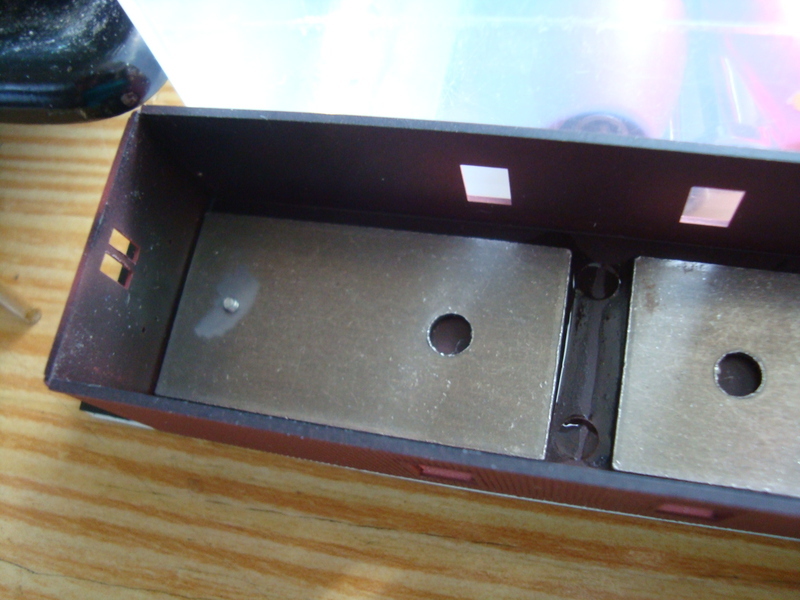 Remove excess solder by grinding. Resolder if necessary. The ladders turned out well, Lutz...you have a good eye for proportions, and I like your idea for stabilising the ladder, too.